From a food processor, a blog recipe and an empty peanut butter jar, two University of Oregon students unintentionally started a business. High school friends Keeley Tillotson and Erika Welsh chose to be roommates at the University of Oregon, where Tillotson, now 25, studied journalism, and Welsh, now 26, majored in environmental studies. When they moved to an apartment, they were both very active, with Tillotson running track and Welsh on the crew team. They loved peanut butter and, between the two of them, they ate a jar each week. Then, one of them forgot to buy peanut butter. That seemingly insignificant failure to shop sparked an idea the then-teenagers have developed into a full-fledged business, Wild Friends Foods. Welsh recently reflected on the six years since she and Tillotson became unintentional entrepreneurs. Why did you start creating your own peanut butter? Erika Welsh: Keeley and I grew up loving peanut butter. It was a snack, it was a desert, it was all those things. One day we ran out of peanut butter. [A month earlier], my mom had gifted me a food processor. And Keeley had found a blog post on how to make your own peanut butter. We like to make our own trail mix, so we happened to have all these raw ingredients: coconut, cinnamon, chocolate, raisins and honey. We started making all of these flavors, we put it in jars and started gifting it to our friends. We thought it would just be a fun little weekend project. People started asking, where can I buy it, how can I get more of it, I’ll pay you for it. Neither Keeley nor I were business majors; we didn’t start this to make money. It felt very natural for us to make yummy food and share it with the people we love. It started as a passion project and quickly became a business. EW: We originally started as Flying Squirrel. We were Wild Squirrel, and now we’re Wild Friends. ‘Wild’ was because we started with a bunch of wild flavors. Our squirrel logo [was chosen because] my sister nicknamed me Squirrel when I was little. The friendly part, it kind of plays to our story because Keeley and I are friends. What is your mission as a company? EW: The official mission is making food friendly. Friendly food, to us, is food that is very simple and has friendly ingredients. You can turn over any of our products and the ingredient list doesn’t scare you. You can pronounce everything, whether you’re an adult or a kid. We want our product to not only taste good but to make people feel good. How did you raise the money you needed to start the business? EW: We kind of cobbled together our finances over the years. We did some crowdfunding, and we were able to raise some money through those platforms. It’s a low barrier to entry. With Indiegogo and Kickstarter, your neighbor, your grandmother, your sister—anyone can donate. What about retail—how did you start getting into stores? EW: Our first stores—New Seasons and Market of Choice—were both regional chains. They are very strong in the Northwest and perfect customers for our product. We were able to get in-person meetings with both buyers we needed to see. We were doing direct-store delivery, which is just fancy for we were loading product into the trunk of our car, driving around to every store, every week. We were doing demos at least four days a week. We were so excited to see our little squirrel on a jar on a shelf. We wanted to build a good rapport with these stores so they would keep reordering and maybe do us a favor like put us on an endcap or put us on a display. How do you encourage good communication in your company? EW: It’s always a work in progress. It’s never perfect and it never will be. We want to focus on having a really good team, because we know we can’t accomplish everything we want to accomplish if we don’t have one. Something that’s very important to us is having one-on-one meetings with everyone on our team. We have that 30 minutes without anyone interrupting; it’s just like, ‘How are you doing? What’s going on? What’s on your mind? What’s on your heart? Let’s talk about it.’ We’ve really discovered those, in the past year, being really helpful. Nut butter is a crowded category. What's your approach to differentiating your products from others? 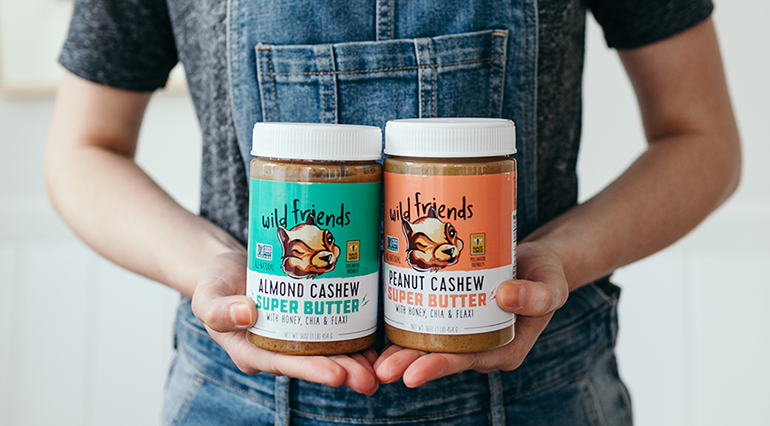 EW: Wild Friends is a one-stop shop for nut butters. We have peanut butter, almond butter and sunflower butter, and in those categories, we have plain and we also have flavors. Instead of having one jar, people are going to have several different jars because they have a variety of needs or wants in their family. We want to be that brand that people really connect with. We’re really excited to add to our product line and reach our customers through other products. We want to be in many aisles in the grocery store. Let’s build our company and offer way more than just peanut butter in a jar.